For more than a century, Faribault Foods has delivered a spectrum of canned goods to consumers, steadily building a brand portfolio that includes household names such as Butter Kernel, Luck’s, Chili Man, and KC Masterpiece. In 2014, the company merged with Arizona Canning Company as a result of being acquired by La Costeña, a Mexican food company, further expanding both organizations’ offerings and capabilities. 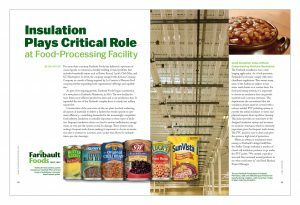 As part of its ongoing growth, Faribault Foods began construction of a new plant in Faribault, Minnesota, in 2016. The new facility features faster, more efficient production lines and a can-production line. It expanded the size of the Faribault complex there to nearly one million square feet. Construction of the new state-of-the-art plant involved evaluating all aspects of materials to deliver a facility that would operate at optimum efficiency—something demanded in the increasingly competitive food industry. Insulation is critically important to these types of facilities. Improper insulation choice can lead to system inefficiencies, energy waste, or even put the system at risk for damage. These systems must undergo frequent wash downs, making it important to choose an insulation that is resistant to moisture, and a jacket that allows for multiple-times-per-day cleanings. The Faribault installation was a challenging application. As a food processor, Faribault Foods must comply with strict cleanliness regulations. That means many areas of the facility are subject to hot water wash downs on a routine basis. For food-processing systems, it is important to choose an insulation that can provide moisture and corrosion resistance. 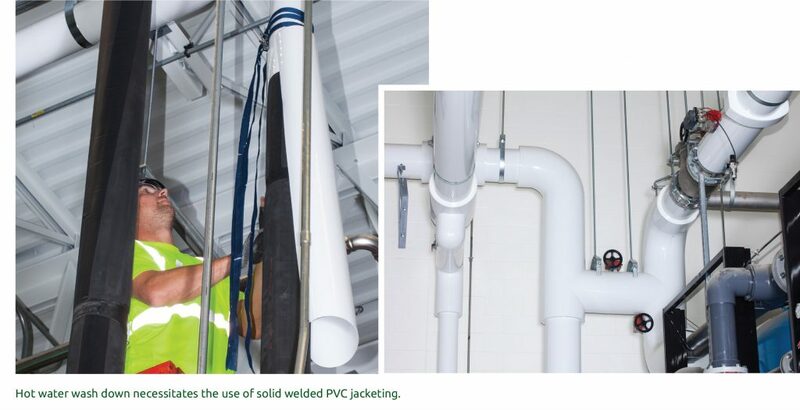 This requirement also necessitated that the insulation chosen must be covered with a solvent-welded PVC jacketing system to provide the initial resistance to water and physical impacts from repetitive cleaning. This jacket provides an outer layer to the designed insulation system and increases its moisture-resistance, which is extremely important given the frequent wash downs. The PVC jacket is easy to clean and gives the system a high level of protection. 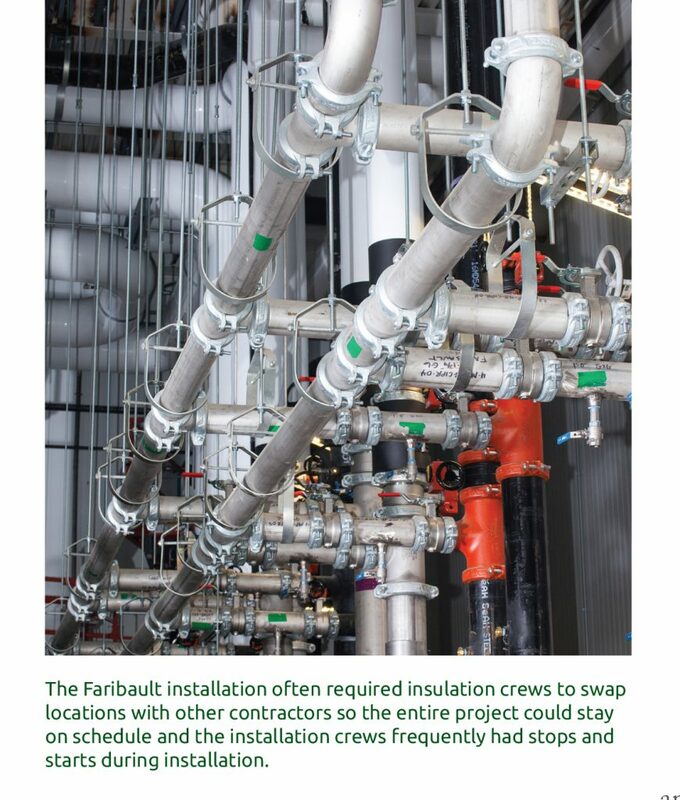 Water, as always, is insulation’s worst enemy, so Faribault’s design build firm, the Stellar Group, evaluated a number of closed cell insulation products to go under the PVC jacket. “We created a specification and then reviewed several products to see what could meet it,” said Brad Blocker, Project Manager. The insulation product chosen for this project is 38% more thermally efficient than the next most-moisture resistant insulation material. This feature reduced the thickness needed while providing the same insulating protection. When paired with a PVC jacket, it also delivered the water and water-vapor resistance desired for low temperature insulation systems in the food-processing environment and protected the system from efficiency losses. The product was also chosen because it delivers excellent fire safety properties and does not support combustion, having been rated as self-extinguishing, as tested by ASTM D635. It will not support the growth of microorganisms, which eliminates the need for microbicides, as tested by ASTM C1338, G21, and UL181; and also does not contain chlorofluorocarbons (CFCs), hydrofluorocarbons (HFCs), and hydrochlorofluorocarbons (HCFCs), making it safe for use in a wide range of facilities. It is a 99+% closed-cell material that provides no food source for birds or vermin, is stable over a wide range of environmental conditions, and contributes to sustainable building practices, including LEED™ and LBC™. Another major concern for Faribault Foods and its contractors was corrosion under insulation (CUI). This phenomenon occurs when halogen compounds (compounds of chlorine, bromine, or fluorine) become trapped with moisture under the insulation, corroding even stainless steel piping. There are extensive process piping systems and pieces of equipment in this facility made from stainless steel. In an environment such as a food-processing plant, there is the constant threat of moisture and water vapor entering the insulation system. This is especially true if there is a meat processing or cooking element involved, such as with chili or seasoning meat for beans, which have long process times (compared with vegetables, fruits, and juices) and generate high temperatures and high humidity. High heat with humidity and steam can drive moisture into an insulation system, so the system needs to be very moisture resistant, well-sealed, and easy to clean. Chlorine is one of the most common chemicals used for cleaning wash downs, so the system also needs to be impermeable. This is managed with: (1) Effective sealing of insulation systems, especially at all termination points; and (2) An insulation that contains low-halogen compounds that could react with moisture. 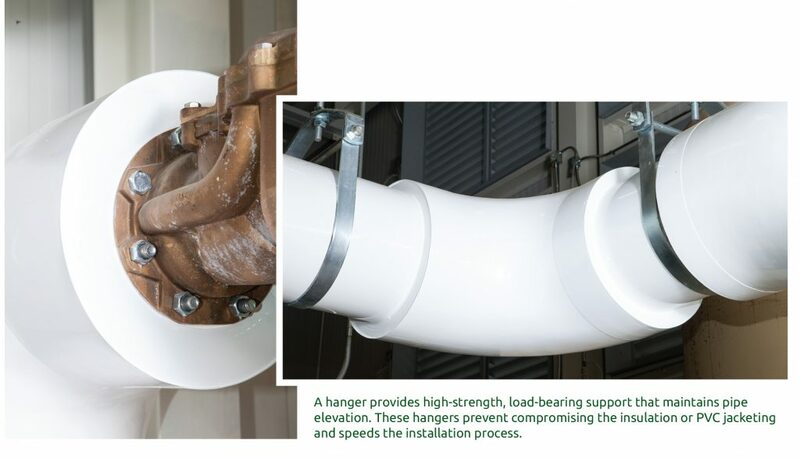 In such circumstances, the insulation that will be in contact with stainless steel piping should be tested for meeting the requirements of ASTM C795 and/or C692 to avoid the content of halogen compounds that can leach out when water is introduced, combining with the moisture, and creating a solution that can corrode stainless steel piping. These performance characteristics have made EPDM an appropriate option for many below-ambient mechanical systems operating as low as -320°F, including chilled water, retail food case refrigeration, industrial refrigeration applications, glycol, brine, ammonia refrigeration, industrial gases, liquid methane, liquefied natural gas (LNG), and liquid oxygen systems. 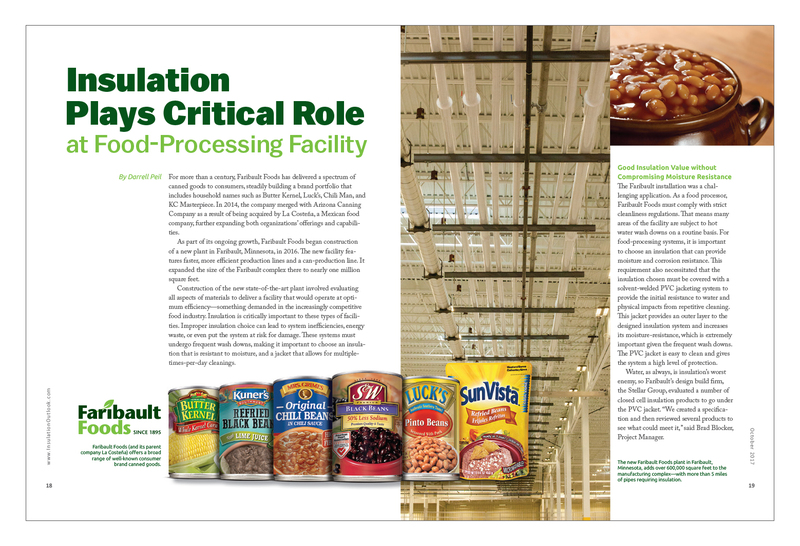 One of the biggest challenges for the Faribault Foods installation was its sheer size. The plant addition added over 600,000 square feet, making the entire complex nearly 1 million square feet. The entire plant used more than 5 miles of pipe insulation with PVC jacketing and over 20,000 square feet of rolled EPDM insulation. In addition, Project Manager Blocker pointed out that the plant layout had the boiler room and the refrigeration areas more than 800 linear feet apart, so any common pipe elements had to account for this span. This project included well over 5,000 linear feet of pipe used for the boiler/mechanical room only. We were dealing with different sizes and with untold connections and joints. The contractors used both pre-slit and unslit elastomeric. The unslit product was used to slide over uninstalled piping. The pre-slit elastomeric used had a positive self-sealing strip that bonded with the EPDM to keep moisture out (remember—there are millions of EPDM membrane roofs installed around the world). Ends were joined with contact cement or a special pressure-sensitive adhesive disc that ensures a solid seal and made installation faster. Pressure-sensitive closures are appropriate for food-processing facilities because there are no fumes or solvent vapors to contaminate products, and it can seal in cold environments. “Installers were able to move quickly and effectively, even when they had to be interrupted because another contractor’s work took precedent. It was easy to pick up where the workers had left off,” said Shelberger. There are several selection criteria to consider in a project like this. Cost effectiveness and system longevity are major system design considerations for an owner who wants to see process efficiency and temperature regulation continued uninterrupted for the life of the installation. As important as material selection is for this, detail and quality during installation are also key. The expectation of high levels of moisture and water vapor in the environment drives the need for effectively and completely sealed moisture-resistant insulation system components. This sealing requires skilled labor that is highly familiar with the specialized needs associated with these kinds of installations. When a well-designed and -installed system is in place, an owner can see not only a financial return on his investment, but a reward in the system’s reliability.